Reese: Good afternoon. It is draft time again. The scouts are very excited about their game day. Marc Ross and Chris Mara and all of our scouts, Kevin Abrams, all those guys are in our draft room trying to finalize our draft board and get ready for the big day. So I am ready for any questions that you guys might have. Q: Who have you decided on? A: We decided that we are going to take our pick at 23. Q: Has what you have done in free agency given you some flexibility with what you can do in the draft? A: Well, you always take that into consideration with what you have on your roster right now, but going into the draft, like I say every year, we just go in there trying to pick the best players available when we are on the clock and we will continue to use that pattern. Q: I don’t think you have ever traded in the first round. Is there a reason for that and what is your philosophy? A: If we have an opportunity to trade in the first round, we will do that. But right now, we will just kind of let the board fall like it does and if we feel like we want to move up to get somebody, then we will move. It costs to move up, though. If you are going to move up, then you are going to give up a lot of draft picks to move up. Even if you move up just a couple of spots, you have to give up some draft picks to do that and we like taking our picks, but if there is somebody up there that we love and we think we can move up to get, then we will keep those options open. Q: Do you still feel like you need some help on the offensive line, whether that is early or late in the draft? A: We feel like we can use help anywhere, at any position. We just want to create a lot of competition at every position going into the training camp, so we are going to try and upgrade at every position like we always do and offensive line is definitely a spot that we would like to upgrade as well. Q: When you go back and look at where things stood at the combine to now, has there been that much movement as far as guys surprising you? A: Our scouts are on top of all of these guys. At the combine, a lot of people are just now learning about these guys, but our scouts already know these people, so we don’t have a lot of surprises. Every now and then you have a couple surprises, a guy could jump up quickly out of nowhere and you have to do some extra work on him, but for the most part we don’t have a lot of surprises going into the draft. Q: How much do you weigh what they did in college versus this three to four month process? A: Yeah, we try to put it all together. We look at what the players do on the field. We grade the players on the field. The gymnastics stuff that they do during the combine is part of the equation, but we look at these guys as football players first and we just go on our experience as scouts and try to look at the player more than what the gymnastic numbers say. But that is part of the equation as well. Q: D.J. Fluker is a guy who came in with 1st round pedigree. Is he someone that you think still has that potential? A: Well, we hope so. D.J. 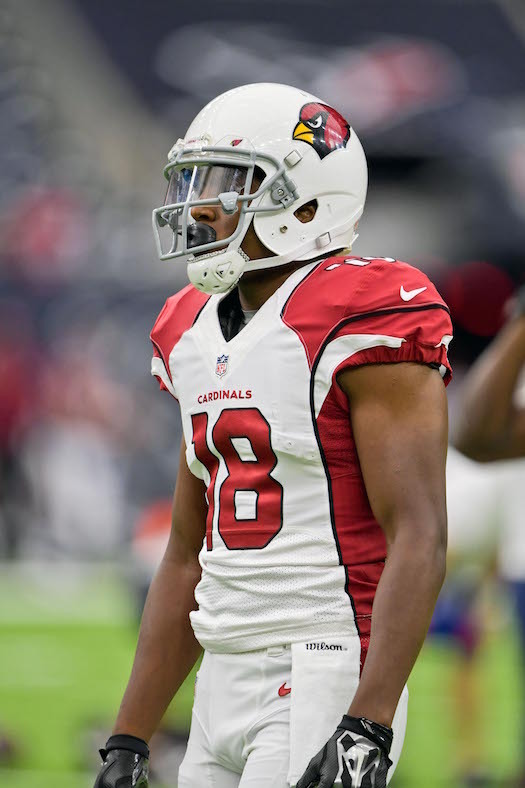 is going to come in and battle for a position just like everyone else on the squad and hopefully the change of address and just a new scene for him will re-energize him and I know he wants to prove that he is still a number one type talent and we are looking forward to giving him the opportunity. Q: Do you see him as better at guard or tackle? A: Yeah, coming out, we thought he could play both. We thought that he had some versatility. We thought he could play tackle, we thought he could play guard. I think he is going to get an opportunity. 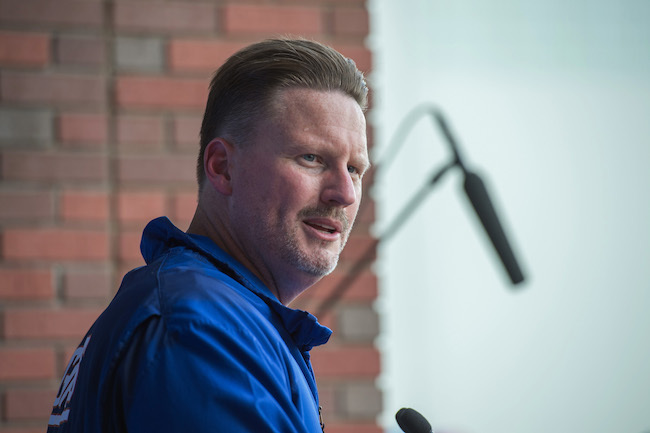 I am not the coach, Coach McAdoo will make the decision of where he plays, but we think he has some versatility to play guard or tackle. 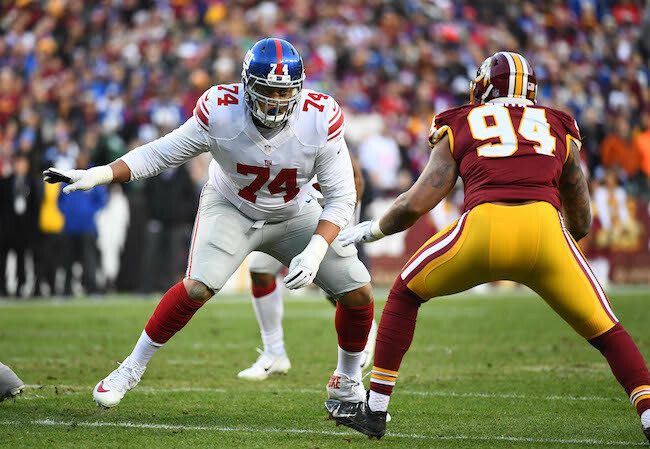 Q: At the end of last season, you spoke about considering a position change for Ereck Flowers. At this point, do you see him as the left tackle? A: Again, it is spring and it is a long time before we play. In the spring we will experiment with different lineups and situations with our offensive line, so it is a long way to go. That is to be determined later by Ben and the coaching staff, but we will tinker with a lot of things in the spring. Q: Despite always looking for the best available player, when you look at last season, there clearly has to be some areas that you need more help. A: Of course. You are always trying to tie best player available with what our needs are. Q: Do you ever do that? A: We do it a lot. Sometimes it falls that way as this is the best player available and also ties into value and need as well. We try to tie them both together, but we are not going to reach for guys just because we think it is a need position for us. Q: Does that tie into the cost of moving up? A: Yeah, all of it ties into the cost of moving up. Q: You have been in a lot of drafts. Last year there were two guys that you liked a lot that teams traded up in front of you to get. Does that make you more aggressive this year so that that won’t happen again? A: We liked all the players that got picked in front of us last year. You are saying there were two guys, but there were a lot of guys we liked in front of us. So are you going to move up every time just because you like somebody? You pick where you are for a reason. We are at 23. We had a decent season, so we are picking farther back in the draft. If you don’t play well, then you pick up front. But again, if there is someone up there that we love, that we have to have and we are dying for and we are willing to give up our draft picks to move up to get him, then we are open to doing that. Q: Does it get muddy when you are looking at guys who are potential late 1st round and early second round picks? A: You never know. You never know how the players are going to come off of the board. You look at this draft and you have five or six blue chip players and then you have the second level of your first round guys and you never know how they are going to come off. Some people may see them a little different than how we like them. 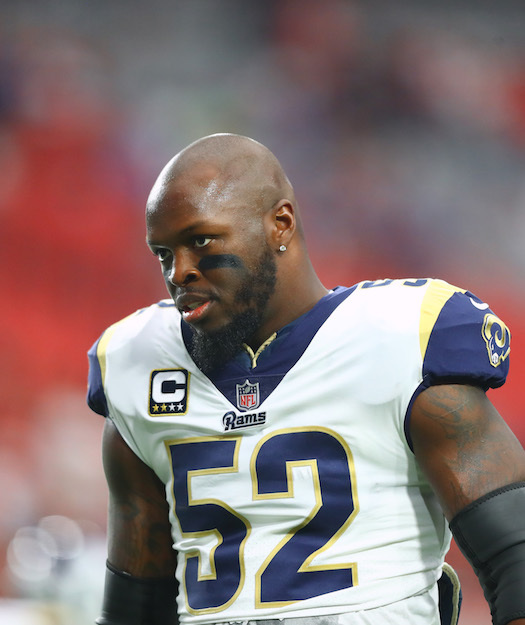 When you are picking later in the draft, you just kind of have to sit and wait and let somebody just start to fall and you are like, ‘Let’s move up and get this guy if we really love him that much.’ But again, if you do that, then you are going to give up draft picks and we don’t like to do that. Q: Do you have 23 names in your first row? A: We have 32 names in the first row. That is why we call them rows. They are not all first round picks, but they are in the first row. Q: How many players have a draftable grade on your board? A: I am not going to talk about how many players have draftable grades, guys. Q: Do you consider the depth chart as one of the tools in your decision-making? A: We are just picking the best players available. We have players on our board, we have all of our players on our team currently on the board as well to see how they fit, but we are just trying to pick the best player available when we are on the clock. 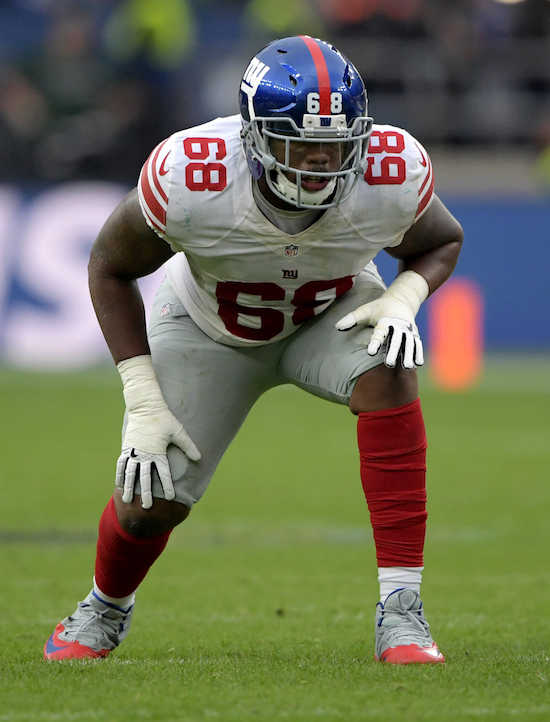 Q: With Johnathan Hankins going to the Colts, how do you rate defensive tackle in terms of depth and potential need? A: We think that, obviously, Snacks is a good player there. We have Bromley, we have Robert (Thomas), so we have a couple more guys that we expect to step up and help fill that void and obviously we will continue to look at free agency and we will look in the draft to see if we can add some depth to that position too. Q: Were you surprised that Hankins left? A: No, I am never surprised about anything during free agency. Money talks and we are happy for Hank. We are big Hank fans around here and we wish him well. Q: In 2007, your draft led to a Super Bowl title. Do you look at this year’s crop and this draft in general as something that can be a key component in building a championship team this year? A: We hope so. We hope that the kids that we draft in this draft will help supplement the needs that we have on the roster and hopefully we can get some players in here out of this draft that can help us get over the top. Q: You said at the end of the year that Eli was on the back nine of his career. How did you go about looking at quarterbacks this year? Was it any different from the past? A: Not really. We evaluate everybody the same every year, regardless of what we are looking for and what we think we need and where we think the depth should come from. We are giving everybody a fair assessment as we go through all the players and we grade everyone the same, whether you are from a big school, a small school, if you are short or if you are tall, it doesn’t matter. We give everyone the same degree of consideration. Q: Did you find yourself looking more at quarterbacks this year? A: Myself personally? I probably looked at more quarterbacks this time then I did at other times, but there are only so many guys that you can look at. You can ask Marc Ross about anybody from any school and he can tell you in two seconds because he sees all the players and evaluates all of them. Obviously it is hard for me to evaluate every single player. 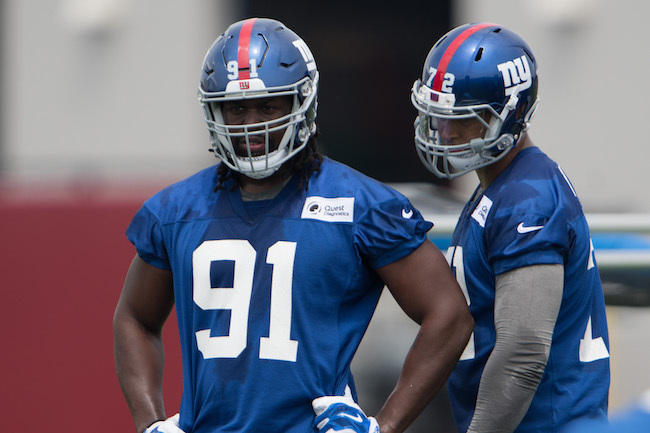 Q: When you are looking for the successor for Eli, is Geno (Smith) a candidate? A: Well, Geno is on the roster and is going to have a fair share to compete just like everyone else. He is excited about being here and we are excited to have him and he is going to come in and compete just like everybody else, so we will see where that goes. Q: Have you decided if you are going to exercise the fifth-year option on Odell? A: We are going to discuss that when the time gets closer. We will keep all of our options open with respect to that. Q: You had some critical comments about him at the end of the season. How do you think he has responded to that? A: You guys called it critical. I don’t think it was critical. I think some of you guys framed it as critical, but I didn’t see it that way. Q: Critiqued maybe. How do you think he responded to the general message? A: Again, I think he is a guy that hears what we are saying and like John (Mara) said, ‘We are not worried about Odell.’ He is a young kid, he is growing up every day and we think that he is going to continue being a tremendous football player and a tremendous representative of our organization here. Q: At the owners meeting, Ben McAdoo said that Geno compares favorably to the quarterbacks in this class. Does that change what you guys might do next week at quarterback? Q: How do you personally evaluate this team’s draft performance over the last three or four years? A: It is not my job to do that. You guys can do that. We go in every year and do our best to draft the best players available and try to develop the kids that we get on the roster, so if you win, it is a good draft and if you don’t win, then it is a bad draft. You guys can evaluate that. I am not here to talk about how we are evaluating what the drafts are. Q: If you take a quarterback next week, I am sure that you hope he doesn’t play soon, but how do you weigh taking a pick higher in the draft that is going to be a developmental guy? A: Again, you just take the best player available and however he fits on roster – if you take a quarterback high, if you take him in the seventh round, wherever you take him, you hope that everything falls right for them. If they have to play, you hope it is the right time for them to play. But if you are worrying about when is he going to play, when is he not going play, you might miss out on the right player. You just have to take the best player available. Q: Isn’t quarterback different though? A: Yeah, but again, everyone has to get picked somewhere. Last year Prescott got picked and people didn’t regard him highly and he played tremendous. He was at the right place at the right time, got the right opportunity and he did a very nice job for them. Q: Would you rule out drafting a first round quarterback? A: We will keep all of our options open. Q: If you draft a quarterback this year, do you think they will need two or three years to sit and develop behind Eli? A: Again, who knows what will happen. 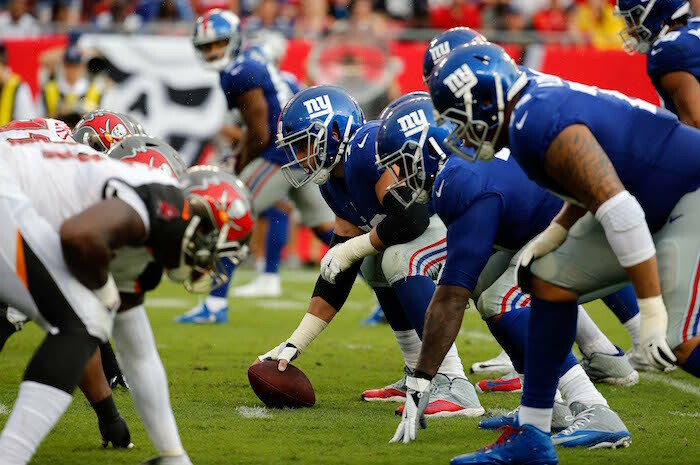 If you draft a quarterback in the first or second round, if Eli gets hurt and we don’t have a quarterback that is ready to go and you have a quarterback on the roster, you have to get them ready to play. That is the coaches’ job to do that, it is our job to have somebody waiting in the wings to play, so you just never know. 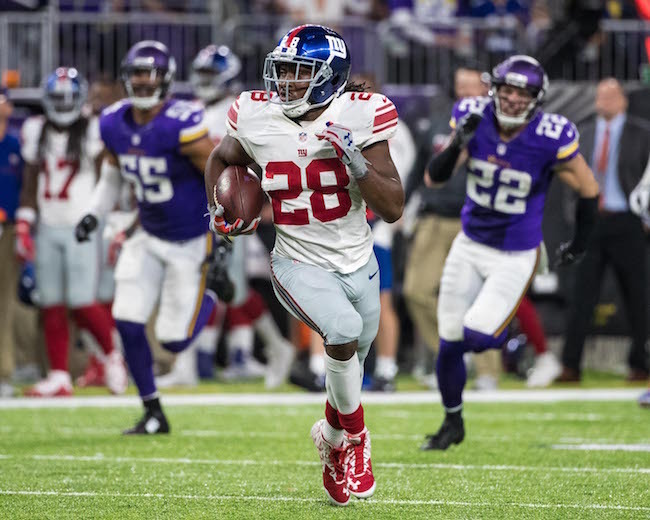 We think that Eli has some good years left to play for us and we are trying to put good people around him as well and hopefully the offense can pick up the pace more than last year. Q: Do you agree with the consensus that the quarterbacks in this class all could use time to sit and develop? A: That is what you say every year. It is hard to bring guys right out of college, and to play up here is such a different game and the college game is a lot different now, so it is hard for guys to just jump in and play up here right away. But we have seen guys do it, but I think you have to limit what they do and you can’t give them everything at the beginning. Q: As you personally look at this draft of quarterbacks, where is your determining factor on if a certain player can be your guy for the future? 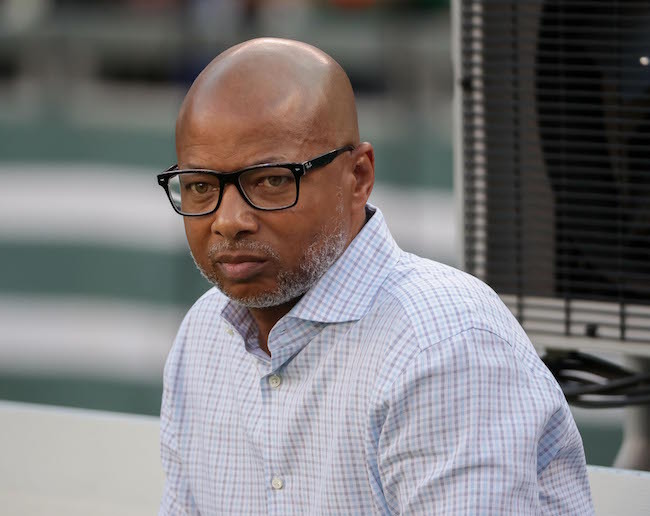 A: Well, again, we look at what their skillset is and we look at what we like to do and see how many guys have that skillset and what part of the draft can they be possible picks for us if we decide to pick one. Q: What is Ben’s involvement in the draft process? A: Just like always, all of our coaches are part of the process and everyone has an opinion on who we take, so he is a big part of it, like every coach has been here. Q: But you have the final decision? A: It is our decision. If it doesn’t work out, then it is my decision. Q: Have you ever looked back at a draft pick and admitted to no one but yourself that you made a mistake? A: Plenty of times. You don’t get all of them right. I don’t think anyone is batting 1.000 picking players. But yeah, plenty of times. Q: How do you factor age into drafting players? A: That is not a big issue for us. If a guy is 24 or 25, that is still super young. Q: How has the role of the tight end changed since this team picked one in the first round with Shockey? A: I think it is whatever your offensive coordinator is, what your head coach’s philosophy is, and I think that is what determines what your tight end role is. You look at different teams and tight ends are a big part of what they do and you look at us and we haven’t been a two tight end kind of offense under Ben. But we do feel like a tight end could come in and help us. We brought (Rhett) Ellison in to be part of that equation of helping the run game, and I think he is a very capable receiving as well, so there are some good tight ends in the draft, we believe. I like a lot of different positions, but it just depends on what the offensive coordinator thinks and how much he wants to use a tight end. Q: Have you not used that aspect of Ben’s offense because of the personnel here? A: You can ask Ben about that. I think that the best coaches make an adjustment to really what your personnel is and I think that is part of being a coach. You don’t always have the perfect pieces to what you want and you have to make the adjustment and I think the best coaches do that. Q: What is the challenge in evaluating players that are multi-dimensional? Guys like Jabrill Peppers and Christian McCaffery. A: Well, it is not the challenge, I think that when you get a player that has a skillset like McCaffery and maybe Peppers, these guys do a lot of different things for their team and you can save yourself a roster spot more than anything else. If you get a guy like that, then maybe you don’t have to go out and get a return specialist or…obviously both those guys would be tremendous on special teams, so they can do a lot of things. But to their defense a little bit, I think they get hurt a little bit because they play so many different positions and people say, ‘Well, what does this guy do?’ I think that maybe devalues them a little bit. But we like guys with a lot of versatility and those are two good players. Q: The mock drafts say that the Giants have to take an offensive lineman at 23. To that, you would say? A: I would say that we are going to pick the best player available. The video of a Giants Insider Q&A with running back Paul Perkins is available at Giants.com.